Hi Seniors!!! Once the T-shirt style has been chosen, we will need to order quickly to get your shirts to you before the end of the semester. Please complete the form below with your t-shirt size order for the 2019 Senior Shirt. Remember, your shirt is covered by your Senior Dues Payment...so if you have NOT PAID your Senior Dues, you need to do so before your shirt will be ordered/ delivered to you. You still have time to pay your dues, but we are ordering the shirts this by the end of September - so if you do not place your size on this form...we will not/ can not order you a shirt. 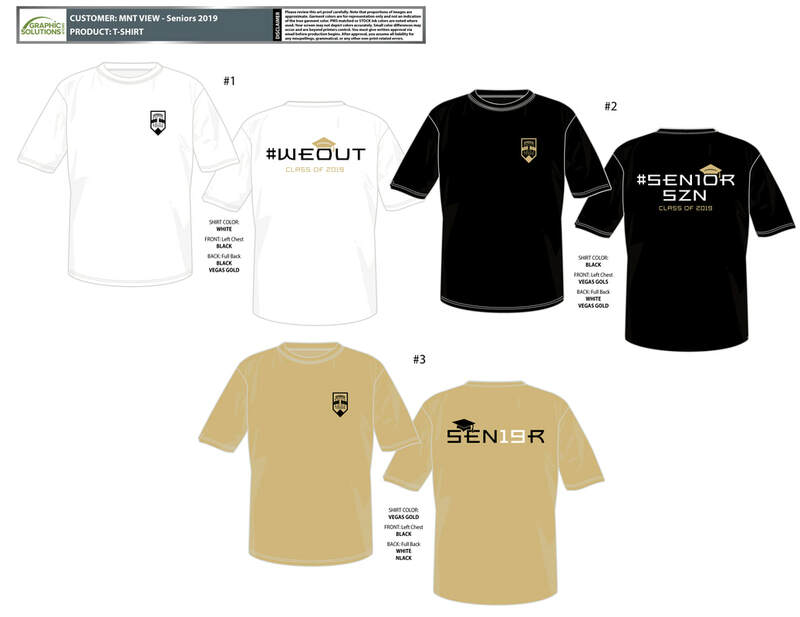 Below are the options for this year's Senior t shirt. Click VOTE NOW to cast your vote for the Senior t shirt design and shirt color for the Class of 2019!